This lamp is based on the shapes of pitcher plants. 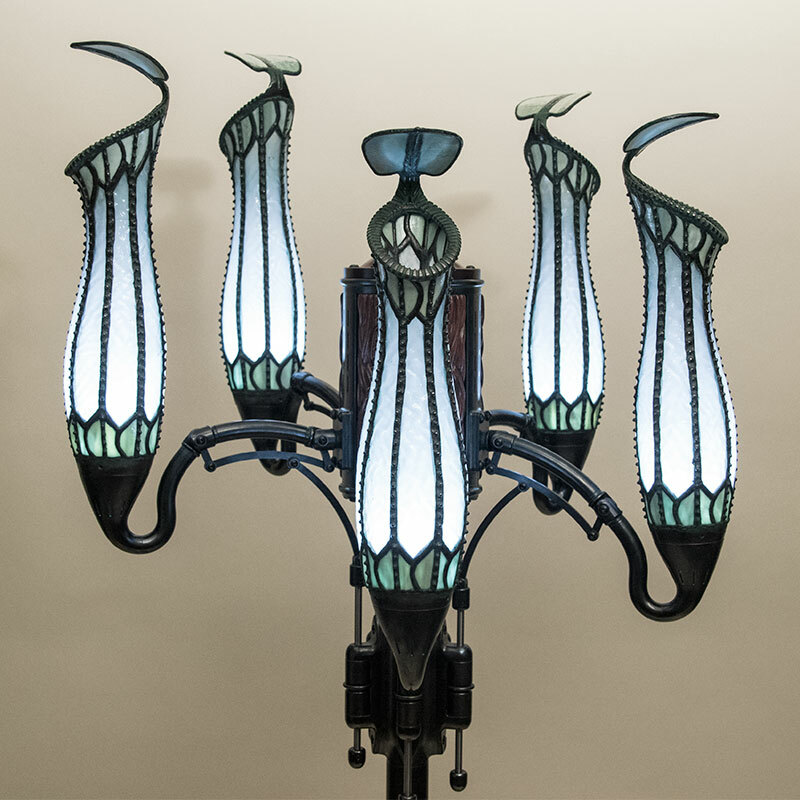 The lamp heads and their mechanisms are made of stained glass, red bronze, phosphor bronze, brass, and copper. The lamp body is made of brass and mahogany. Most of the fastener hardware is stainless steel. Each of the five heads is individually height adjustable. 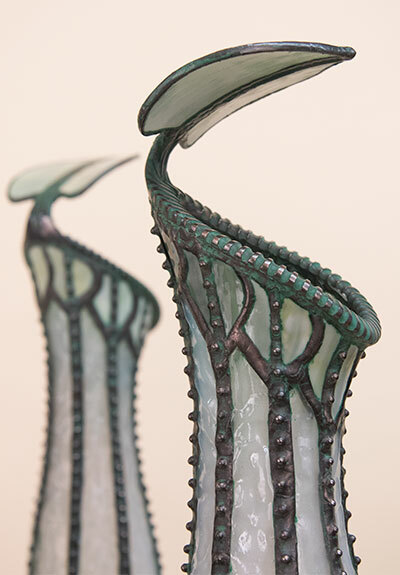 The curved glass sections were formed by slumping sheets of stained glass over custom refractory forms in a furnace, and then cutting the glass pieces to shape on a glass-cutting bandsaw adapted to cut in 3D. The glass pieces were joined with standard stained glass assembly techniques using copper foil and solder. Some of the metal parts were cast from 3D printed waxes, and some were machined with a CNC milling machine. 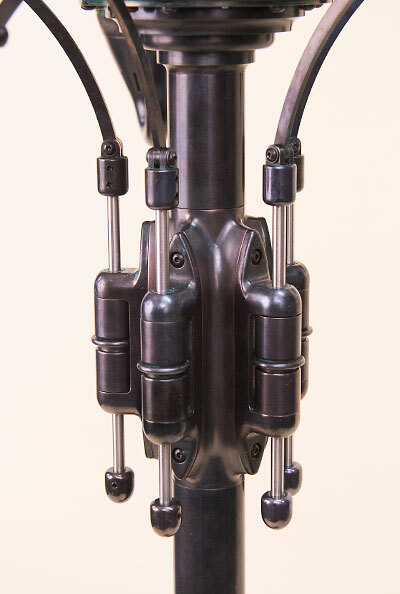 The articulated main stems and joints of the lamp heads are hollow so that electrical wires can safely pass through them. All of the metal parts plus the assembled lampshades were copper plated for an even base color and then patinated. The overall height of the lamp is about 63 inches. Each lamp head is lit with a 60W equivalent candelabra base LED bulb and with a 16 segment RGBW Neopixel LED ring. The main bulbs and the LED rings are separately controlled both through a wireless remote and through a button on the top of the lamp's central hub. The images shown here represent four years of research, design, and fabrication. The main bulbs swamp out the RGBW LEDs, but the LEDs by themselves produce a very wide range of colors. The wireless controller for the lamp has controls for the main bulbs, LED ring intensity, individual intensity controls for Red, Green, Blue, and White, plus a Save Settings button to capture any chosen color as a default, and a Restore Settings button to load the default color. The lampshades were the starting point for the entire project, and were a major challenge to make. The stained glass in this project all came from Youghiogheny Glass. There are 42 formed and cut pieces of glass in each lampshade, plus cast, machined, and formed metal parts, all joined with copper foil tape and solder. The main seams were embellished with brass spheres to give an even more organic look. I plan to do a lot more with this glass forming and cutting technique. 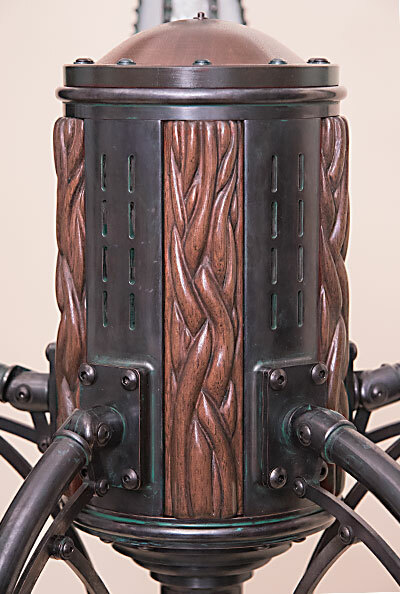 The lamp hub is made of machined brass and carved mahogany and is the mounting point for the arms of the five lamp heads. It contains the electronics that run the lamp's main bulbs and LED rings. The core of the electronics is an Arduino Leonardo and an HC-06 Bluetooth module. The small pushbutton visible at the top of the hub dome provides on-off control over the lamps, with a push-and-hold sequence including main bulbs, main bulbs plus LED rings, LED rings only, and LED rings only in a color-changing demo mode. The brake is made of brass and stainless steel, with polycarbonate split cone clamping elements inside each section. It serves to keep each lamp head at the chosen height. All brass parts were lathe turned or CNC machined. Pulling down on the middle ring of each brake will release its hold on the center stainless steel rod and permit the linkage to move and the lamp head to be raised and lowered. 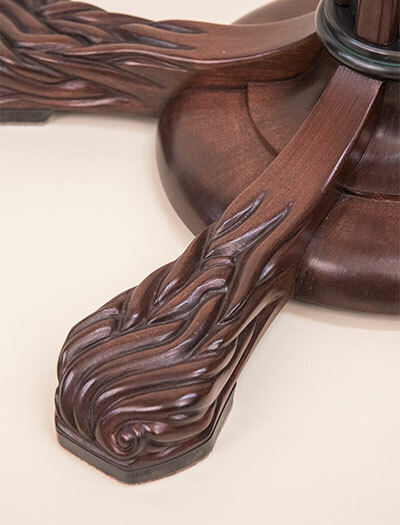 The lamp base is made of turned and carved mahogany. The center portion was glued up as a radially segmented blank, turned, and then cut apart and trimmed to final dimensions. The feet were glued up as blanks, CNC machined for basic contours, and then biscuit-joined and glued up with the center segments to form the entire base. The carving was done after all of the joinery. All woodcarving on the lamp parts was done by hand. Each foot has a bottom brass pad, and a felt pad adhered to each of those.